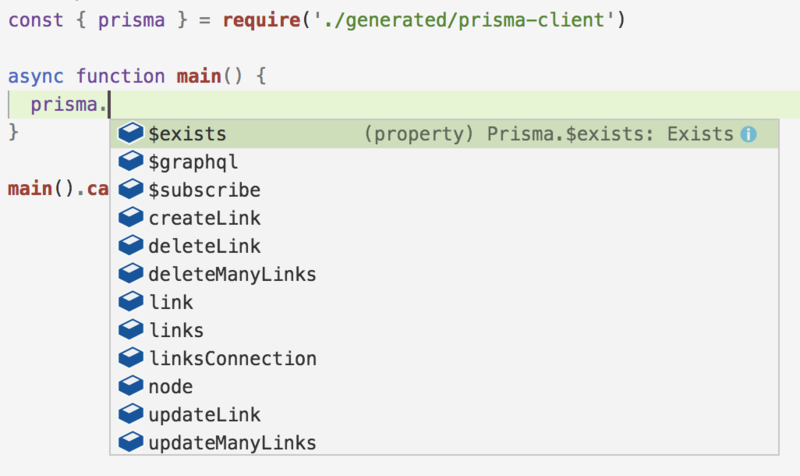 In this section, you’re going to setup Prisma along with a connected database to be used by your GraphQL server. By now, you already understand the basic mechanics of how GraphQL servers work under the hood - surprisingly simple right? That’s part of the beauty of GraphQL, that it actually only follows a few very simple rules. The strongly typed schema and the GraphQL engine that’s resolving the queries inside the server are taking away major pain points commonly dealt with in API development. So, what’s then the difficulty in building GraphQL servers? Well, in real-world applications you’re likely to encounter many scenarios where implementing the resolvers can become extremely complex. Especially because GraphQL queries can be nested multiple levels deep, the implementation often becomes tricky and can easily lead to performance problems. The first option is problematic since dealing with SQL in resolvers is complex and quickly gets out-of-hand. Another issue is that SQL queries are commonly submitted to the database as plain strings. Strings don’t adhere to any structure, they’re just raw sequences of characters. Therefore, your tooling won’t be able to help you find any issues with them or provide additional perks like autocompletion in editors. Writing SQL queries is thus tedious and error-prone. The second option is to use an ORM which might seem like a good solution at first. However, this approach usually falls short as well. ORMs typically have the problem that they’re implementing rather simple solutions for database access, which when using GraphQL won’t work due to the complexities of queries and the various edge cases that can arise. Prisma solves this problem by providing you with a convenient data access layer which is taking care of resolving queries for you. When using Prisma, you’re implementing your resolvers such that they’re simply forwarding incoming queries to the underlying Prisma engine which in turn resolves the query against the actual database. Thanks to the Prisma client, this is a straightforward process where most resolvers can be implemented as simple one-liners. The Prisma server provides the data access layer in your application architecture, making it easy for your API server to talk to the database through Prisma. The API of the Prisma server is consumed by the Prisma client inside your API server implementation (similar to an ORM). The API server is what you’ve started building throughout the previous chapters using graphql-yoga. In essence, Prisma lets you easily connect the GraphQL resolvers in your API server with your database. In this tutorial, you’re going to build everything entirely from scratch! For your Prisma configuration, you’re going to start with the most minimal setup that’s possible. The first thing you need to do is create two files, which you’re going to put into a new directory called prisma. prisma.yml is the main configuration file for your Prisma setup. datamodel.prisma on the other hand contains the definition of your datamodel. The Prisma datamodel defines your application’s models. Each model will be mapped to a table in the underlying database. So far, the datamodel for your Hacker News app only contains one data type: Link. Because Prisma uses GraphQL SDL for model definitions, you can basically copy the existing Link definition from schema.graphql into datamodel.prisma. There are two main differences compared to the previous Link version from schema.graphql. First, you’re adding the @id directive to the id: ID! field. This means Prisma will auto-generate and store globally unique IDs for the Link records in the database on the id field. Second, you’re adding a new field called createdAt: DateTime! @createdAt. Thanks to the @createdAt directive, this field is also managed by Prisma and will be read-only in the API. It stores the time for when a specific Link was created. You can also annotate a field with the @updatedAt directive to track when a record was last updated. Now, let’s see what you need to do with prisma.yml. To learn more about the structure of prisma.yml, feel free to check out the documentation. endpoint: The HTTP endpoint for your Prisma API. datamodel: Points to the datamodel file which is the foundation for the Prisma client API that you’ll use in your API server. generate: Specifies in which language the Prisma client should be generated and where it will be located. Before deploying the service, you need to install the Prisma CLI. All right, you’re finally ready to deploy your Prisma datamodel and the database that comes along! 🙌 Note that for this tutorial, you’ll use a free demo database (AWS Aurora) that’s hosted in Prisma Cloud. If you want to learn more about setting up Prisma locally or with your own database, you can check the documentation here. Note: Prisma is open-source. You can deploy it with Docker to a cloud provider of your choice (such as Digital Ocean, AWS, Google Cloud, …). Once the command has finished running, the CLI writes the endpoint for the Prisma API to your prisma.yml. It will look similar to this: https://eu1.prisma.sh/john-doe/hackernews-node/dev. The last step is to generate the Prisma client for your datamodel. The Prisma client is an auto-generated client library that lets you read and write data in your database through the Prisma API. You can generate it using the prisma generate command. This command reads the information from prisma.yml and generates the Prisma client accordingly. In the next chapters, you will evolve the API or your GraphQL server and use the Prisma client to access the database inside your resolver functions. Why is a second GraphQL API (defined by the application schema) needed in a GraphQL server architecture with Prisma?